The 1961 Ferrari 250 GT Spyder California SWB, better known as the Cal Spyder, is a rare beauty that is easy to fall in love with. Motivated by distributors, Jon von Neumann and Luigi Chinetti, this Spyder was the last of the truly, open-aired, dual-purpose Ferraris. It was first shown in Geneva in 1960. Only 55 were built in 1961 (125 total were built from 1958-1963) and many of them were unique in some way due to the fact that the vehicles were built for both the race track and for the road. 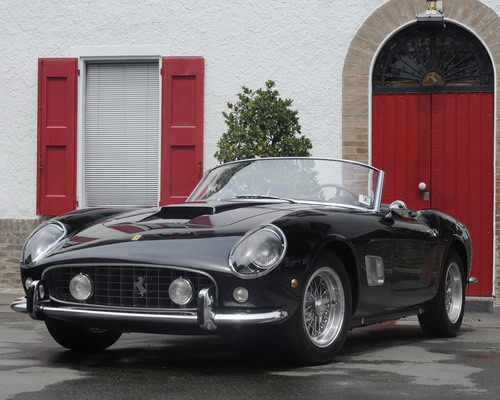 The Cal Spyder was built to replace the LWB California Spyder and was based on the 250 GT Berlinetta SWB. It was built with a Carozerria Scaglietti body construction of a Pinin Farina Cabriolet design. It featured a 60 degree 3.0-liter SOHC V-12 engine, triple down-draft Weber carbs, a 4-speed manual transmission and cranked out 280hp. Disc brakes were introduced and both covered and open headlights were other features of this vehicle. In May of 2008, the Cal Spyder earned the prestigious title of the most expensive vehicle ever sold in an auction. Oscar-winning actor, James Coburn, who played in The Magnificent Seven, sold his black ’61 for nearly $11 million ($6.4 million Euros + fees) to a British radio DJ. The other reason that this vehicle was made famous is because it was featured in the 1980’s movie, Ferris Bueller’s Day Off. A fiber glass bodied replica was used in the movie, but Ferrari later sued for damages because the actual vehicle used was not a Ferrari and the producers did not have the proper permission to label it as one. This entry was posted in Classic Car, Classic Cars, Collectible Cars, Muscle Cars, Vintage Car and tagged 1961, Cal, California, Ferrari, GT, Spyder, SWB. Bookmark the permalink.